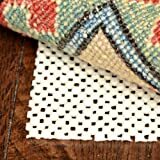 8′ x 10′ Premium Slide StopTM Non Slip Rug Pad for Hard Floors – Made in USA, not China! Premium Slide StopTM is the choice to protect rugs and prevent slipping. 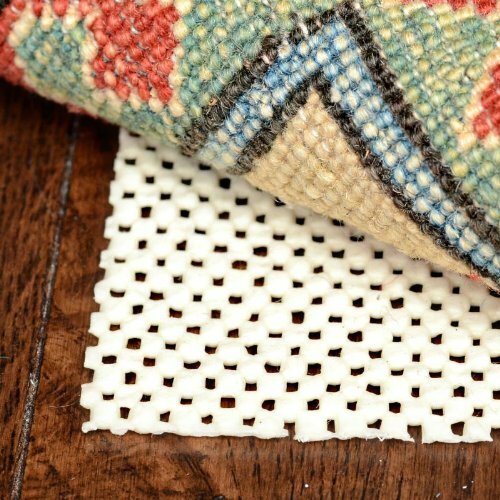 Made in USA, this PVC non slip rug pad is coated with plant based oils to support earth-smart greener living. The oils also prevent damage to the floor. Use 1/8″ thick Slide Stop under any area rug to prevent slipping, prevent wear and damage and add comfort. The open weave construction allows rugs and floors to breath and makes for more effective vacuuming. Slide Stop prevents common rug wrinkling and buckling, making for a safer home. If necessary, Slide Stop is easily trimmed with scissors and can be cleaned with mild soap and water.